The Viner Maxima uses the highest grade carbon available, as used by Ferrari and Ducatti, in its main traingle. These tubes are then hand woven to suit the requirement of the rider. 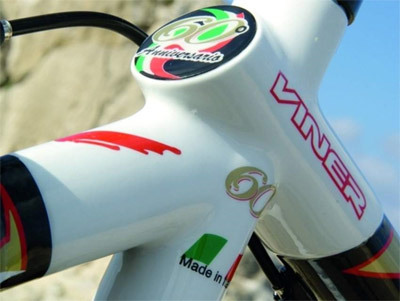 Not only can Viner change the number of layers they weave, and therefore the strength but they can also change the cross pattern and therefore change the ride characteristics of the frame to meet a rider's weight, geometry and ride preferences. They are even able to use 100% carbon re-enforcement on the inside of the tubes where normally manufacturers have to use alloy inserts, i.e. the front mech clamp area, saving weight. The overall effect is that these carbon tubes are over four times stronger than any other carbon tube in the market place - the Maxima also has a new construction method for joining the seat and down tubes to the bottom bracket, increasing bottom bracket stiffness by 20%. 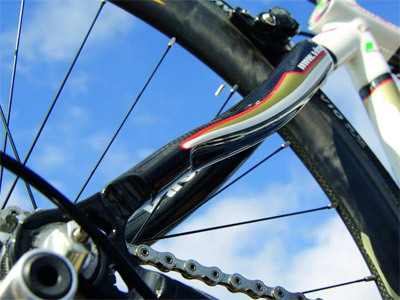 The Fork and the Rear Triangle is made from T900 carbon, the highest quality production available. The Maxima has no rider weight limit, as it constructed to meet the needs of the individual owner, so if you are 150 kilo's then no problem they can make a frame to suit. Most frames are weight or force limited and this is why most pro's, especially the sprinters, get frames made to measure . 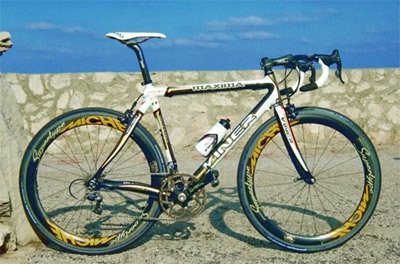 It is very important to make sure that you have a frame fitting session, and talk to us about the kind of riding you plan to do and the sort of bike feel that your prefer, as the frameset will be constructed by hand to meet these individual requirements. This information is a critical part of the specification we require before we discuss the construction of the frame with Viner in Italy. Finished in a choice of colour schemes, or even painted to your own design! Please note: The Maxima is only available as a custom built made to measure frameset and requires a full consultation and frame fitting session, which is included in the price of S$6500. SciCon Case Packing Instruction PDF.